If you watch the nightly news on television you will hear about all sorts of scams and con artists of every sort who are trying to con you out of your hard-earned money. You would think that by now, we consumers would have caught on and learned how to recognize a scam when we see it. But the sad truth is, scam artists are very good at their craft and a sucker is born every minute. You need to know that Carpet Scams are quite common. You need to be aware that common "shop at home" carpet scams could end up costing you hundreds if not thousands of dollars. You also need to be on guard at all times and be leery of any carpet deal that sounds too good to be true. You also need to know that hungry commissioned carpet salespeople might do or say anything just to make the sale. The "basic" Carpet installation scam is becoming quite common these days. Many carpet dealers advertise a special reduced rate for installation or even "free installation" as an incentive for you to buy right away. What they don't tell you is that their "basic" installation only goes so far and if your job requires any work beyond their definition of "basic" there will be some hefty additional charges for you to pay. You need to know what these extra charges are upfront, before you sign on the dotted line. In my Carpet Buying Guide I reveal how much extra installation charges should be, and what you can do to save money on carpet installation by doing some of the easy work yourself. The "free pad" scam has been around for years. Sure, they may offer to give you free padding with your purchase, but is the free pad worth having? Sometimes not. The pad you purchase must meet the carpet manufacturer's guidelines and also match the traffic level you have in your home. If they offer you free pad, you need to be sure that the pad is the right pad for you. Measuring for carpet is a learned ability that often takes years to perfect. New carpet salespeople may not be as accurate as a seasoned carpet salesperson. A talented carpet estimator can save you money by reducing the amount of material waste. Experienced carpet estimators know of many ways to reduce material waste, but this might result in added seams or seaming together smaller carpet scraps to fill less-visible areas such as closets, landings or stairs. Getting accurate measuring of your home is critical. If you are over-measured you stand to overpay by hundreds. The only way to combat over-measuring is to get several estimates from locally-owned carpet dealers and compare bids side by side. Some carpet salespeople will not reveal their measurements to you because they think you will use their measurements to buy from another dealer. I highly discourage you from doing this, as it could backfire and cost you hundreds. 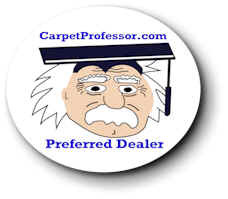 Take a look at my Preferred Carpet Dealers to see who I recommend near you. Many carpet dealers use the "one-price" for the whole job and this is an accepted practice. They want to make it easy for the customer by doing a package deal that includes the carpet, pad and installation for one price per square foot, or by the square yard. This may be a convenience for most homeowners on one hand, but it is also a way for some unscrupulous retailers to hide their high prices for padding and installation. In general, a good quality Rebond carpet padding will typically cost about $4 to $5 per square yard (approx. .44 to .55 per sq. ft.). Carpet installation will average about $6.00 per sq. yard (approx .66 per sq. foot.) Beyond that, what's left is the price of the carpet. Always ask for an itemized invoice that shows the price of the carpet shown separately from the price of the pad and installation. This is a reasonable request and is required documentation you will need in the event you ever have need to submit a warranty claim with the carpet manufacturer. It's getting harder to find reputable carpet dealers these days! That's why I've created my own special hand-picked list of over 400 locally owned Carpet Dealers who offer Free estimates, Knowledgeable staff, Honest measuring, Fair prices and Qualified installers. See Who I Recommend Near You!